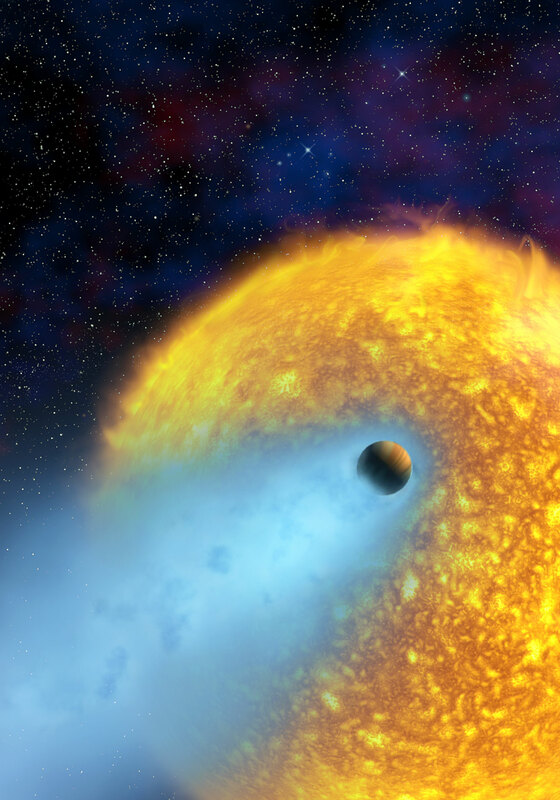 Using the Hubble Space Telescope, for the first time, astronomers have observed the atmosphere of an extrasolar planet evaporating off into space. Much of this planet may eventually disappear, leaving only a dense core. The planet is a type of extrasolar planet known as a 'hot Jupiter'. These giant, gaseous planets orbit their stars very closely, drawn to them like moths to a flame. The scorched planet called HD 209458b orbits 'only' 7 million kilometres from its yellow Sun-like star. By comparison, Jupiter, the closest gas giant in our Solar System, orbits 780 million kilometres from our Sun. The NASA/ESA Hubble Space telescope observations reveal a hot and puffed-up evaporating hydrogen atmosphere surrounding the planet. This huge envelope of hydrogen resembles a comet with a tail trailing behind the planet. The planet circles the parent star in a tight 3.5-day orbit. Earth also has an extended atmosphere of escaping hydrogen gas, but the loss rate is much lower. A mainly European team led by Alfred Vidal-Madjar (Institut d'Astrophysique de Paris, CNRS, France) is reporting this discovery in the March 13 NATURE Magazine. 'We were astonished to see that the hydrogen atmosphere of this planet extends over 200 000 kilometres,' says Vidal-Madjar. 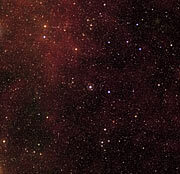 Studying extrasolar planets, especially if they are very close to their parent stars, is not very easy because the starlight is usually too blinding. The planet was also too close to the star for Hubble to photograph directly in this case. However, astronomers could observe the planet indirectly since it blocks light from a small part of the star during transits across the disk of the star, thereby dimming it slightly. Light passing through the atmosphere around the planet is scattered and acquires a signature from the atmosphere. In a similar way, the Sun's light is reddened as it passes obliquely through the Earth's atmosphere at sunset. Astronomers used Hubble's Space Telescope Imaging Spectrograph (STIS) to measure how much of the planet's atmosphere filters light from the star. They saw a startling drop in the star's hydrogen emission. A huge, puffed-up atmosphere can best explain this result. What is causing the atmosphere to escape? The planet's outer atmosphere is extended and heated so much by the nearby star that it starts to escape the planet's gravity. Hydrogen boils off in the planet's upper atmosphere under the searing heat from the star. 'The atmosphere is heated, the hydrogen escapes the planet's gravitational pull and is pushed away by the starlight, fanning out in a large tail behind the planet - like that of a comet,' says Alain Lecavelier des Etangs working at the Institut d'Astrophysique de Paris, CNRS, France. Astronomers estimate the amount of hydrogen gas escaping HD 209458b to be at least 10 000 tonnes per second, but possibly much more. The planet may therefore already have lost quite a lot of its mass. HD 209458b belongs to a type of extrasolar planet known as 'hot Jupiters'. These planets orbit precariously close to their stars. They are giant, gaseous planets that must have formed in the cold outer reaches of the star system and then spiralled into their close orbits. This new discovery might help explain why 'hot Jupiters' so often orbit a few million kilometres from their parent stars. 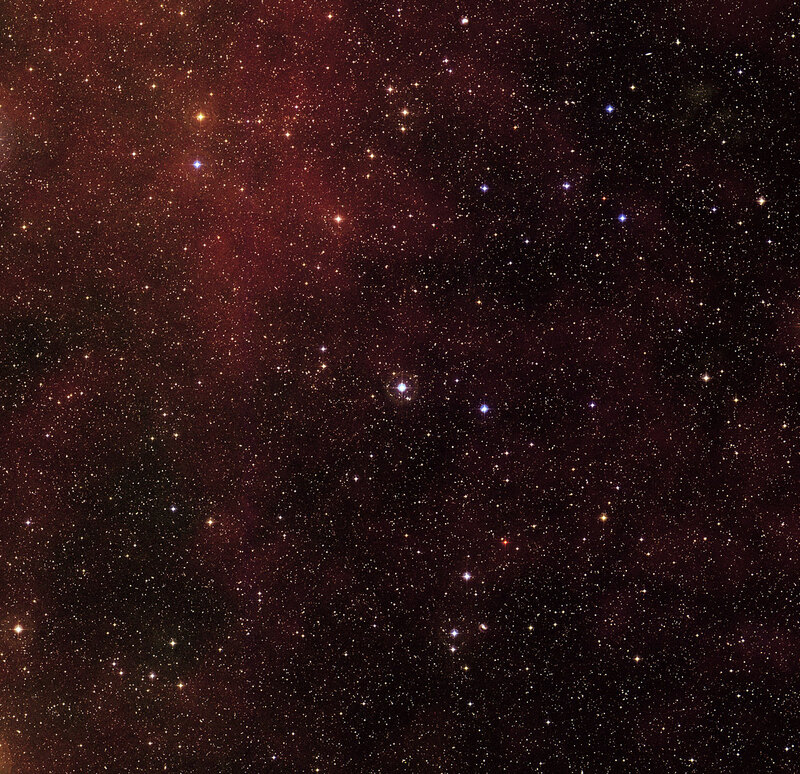 They are not usually found much closer than 7 million kilometres, as is the case for HD 209458b. Currently, the current closest distance is 5.7 million kilometres. Hot Jupiters have orbits that are as brief as 3 days, but not shorter. Perhaps the evaporation of the atmosphere plays a role in setting an inner boundary for orbits of hot Jupiters. HD 209458b has a diameter 1.3 times that of Jupiter, and two-thirds the mass. Its orbit is one-eighth the size of Mercury's orbit around the Sun. The parent star is similar to our Sun and lies 150 light-years from Earth. It is visible with binoculars as a seventh magnitude star in the constellation of Pegasus. 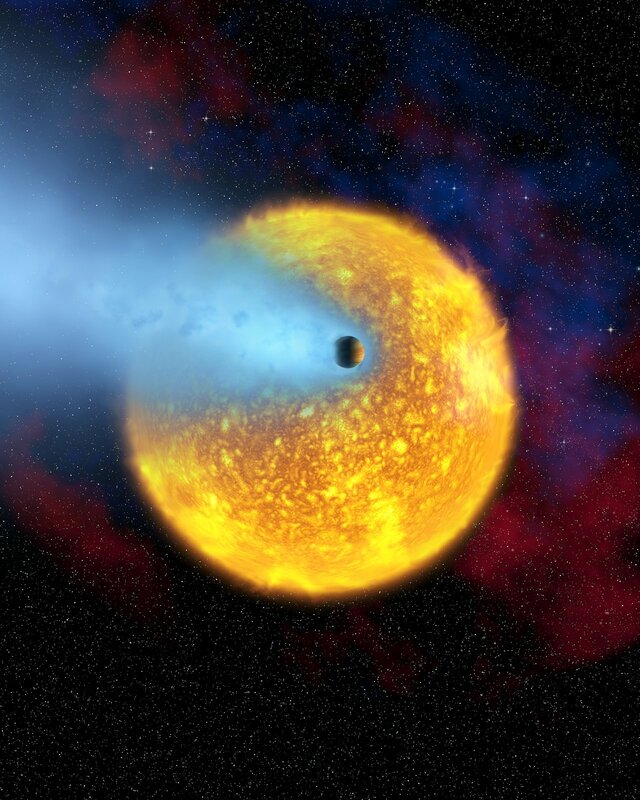 In 1999, this star suddenly entered the astronomical Hall of Fame when the extrasolar planet HD 209458b passed in front of it and partly eclipsed it. This was the first confirmed transiting extrasolar planet ever discovered. In 2001, Hubble detected the element sodium in the lower part of HD 209458b's atmosphere, the first signature of an atmosphere on any extrasolar planet. The team is composed of A. Vidal-Madjar, lead author of the discovery, (Institut d'Astrophysique de Paris, CNRS, France) A. Lecavelier des Etangs, J.-M. Desert (Institut d'Astrophysique de Paris, CNRS, France), G. Ballester (University of Arizona, United States), R. Ferlet and G. Hebrard (Institut d'Astrophysique de Paris, France), and M. Mayor (Geneve Observatory, Switzerland). They observed three transits of the planet in front of the star with Hubble. The observations of the atomic hydrogen envelope were made in ultraviolet (Lyman-alpha) light, using Hubble's spectrograph STIS. Hubble's position above the atmosphere makes it the only telescope currently that can perform these types of ultraviolet studies. The search and the study of extrasolar planets is the aim of several of ESA's scientific missions. Eddington, for instance, due for launch in 2007, will discover large numbers of transiting planets of all types, including many transiting 'hot Jupiters' similar to HD 209458b. These will be ideal targets for the same type of detailed follow-up studies with large space- and ground-based telescopes. This material is being co-released with NASA/STScI/OPO. Image credit: European Space Agency, Alfred Vidal-Madjar (Institut d'Astrophysique de Paris, CNRS, France) and NASA.